And not a minute too soon, either .. Whether it was residue seeds of some previous green manure, or just genuine new weeds that had floated in from the air, a mass of tangly knotty green stuff had interspersed, interjected and downright interfered with most of the raised beds this month, no doubt boosted by the glorious weather. A good session of picking it all out this afternoon certainly made things a lot neater, but also reminded me that I needed to thin out various plants which I’d sown without due care and attention earlier in the season. What a mess. (Before thinning and weeding) ..
.. and after. 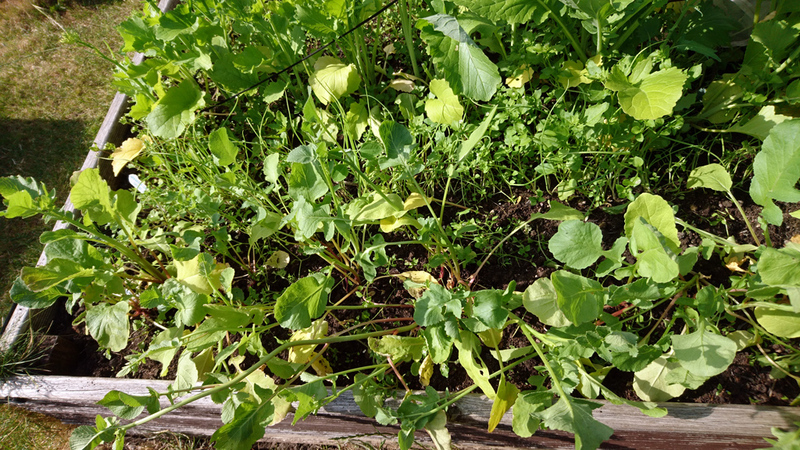 Top: Broccoli Raab, Middle: Spring Onion shoots, Bottom: Radishes. 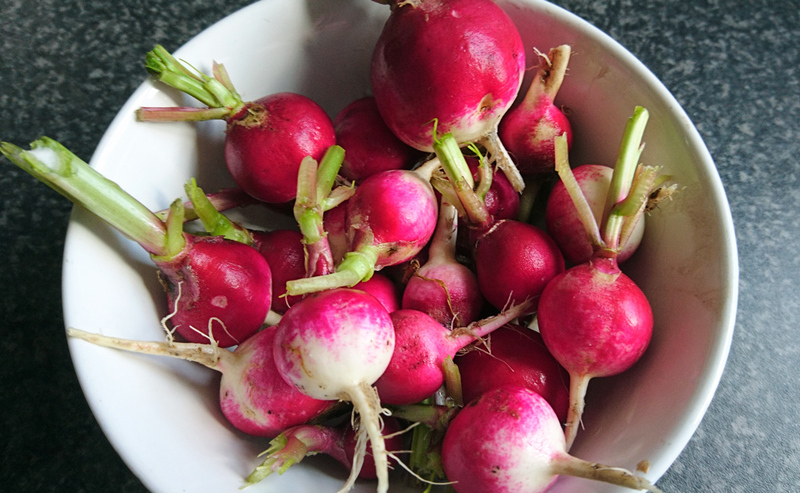 Sparkle radishes. Just add salt, sunshine and a glass of ice cold lager. Before 2018 I’d always resolved to follow the purist approach of growing vegetables from seed, rather than buying part-grown plants. That’s not very easy with some products of course: things like horseradish and French tarragon are only really practical started off as root stock or young plants respectively. 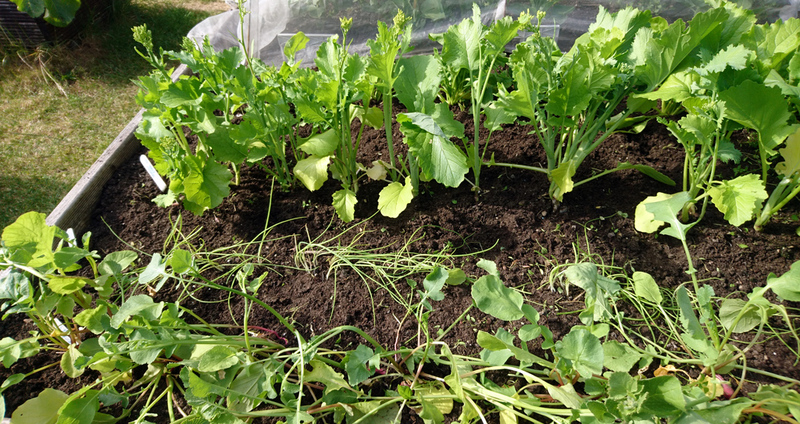 And then again, only very occasionally have I gone for the full-on purist approach and saved seed (for the uninitiated, that’s taking the seeds from veg plants you’ve grown and sewing them the following season). When I did so with some cucumbers, it wasn’t very successful and put me off seed saving to a degree. 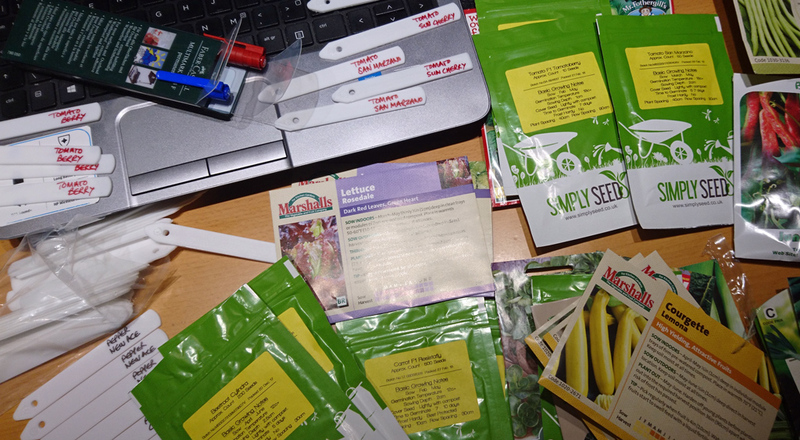 Back in March, prepping seeds and sowing plan. No, each year I’ve been happy enough to buy lots of packets of carefully-chosen and sometimes unusual seeds and let the heated propagators earn their keep. So it was that earlier this year I sowed a variety of interesting tomato, pepper chilli and various other seeds, to set up an enjoyable season. But for one reason and another I wasn’t able to properly shepherd them along, apart from keeping them watered, and by mid-May it was clear that everything would have to be written off. Drastic, but there was no point flogging a dead horse. 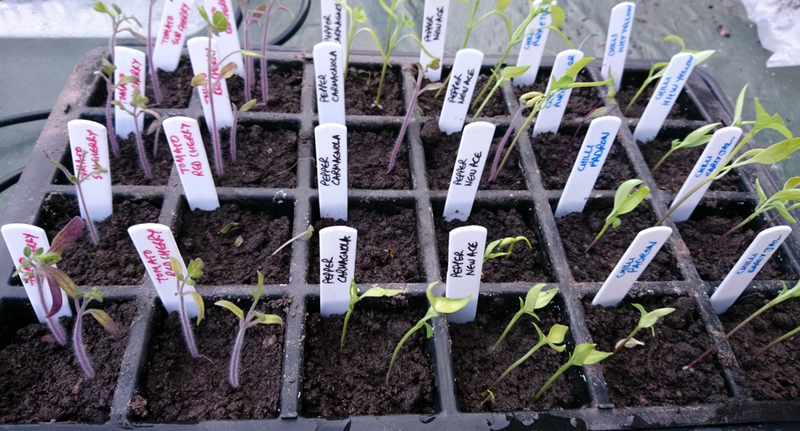 A late spring, lack of airflow, not being able to pot them on, inconsistent temperature (I switched the heating elements off once the seedlings germinated, to avoid them just rocketing skyward in the hunt for light) and perhaps needing a feed: it was a combination of many things. Chucking my previous principles firmly in the bin with the propagator contents, I ordered grafted tomato, pepper, chilli, cucumber and aubergine plants from Marshall’s and Sutton’s. The most popular varieties had sold out, but within a couple of days I received two very cleverly packed boxes of plants from Marshall’s: three Jalapeño chillis, three Ace peppers (New Ace were great last year) and three Moneymaker aubergines. So pre-grown grafted plug plants it was. They’re only three or four inches tall. Straight away I was enlightened to the advantages of professionally started plants, particularly grafted ones. 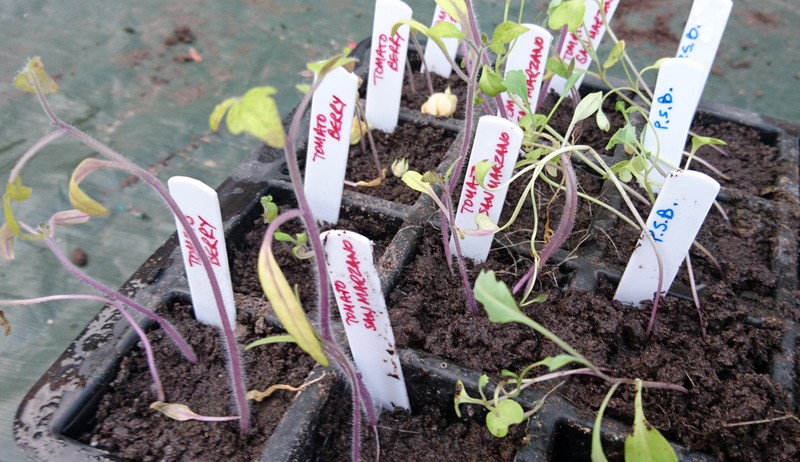 My, albeit neglected, home sown seedlings were spindly and weak, but the new plants were much thicker, leafy, a good green colour and very strong looking. It was a pleasure to pot them on and today, exactly a month later, they’re fully grown, deliriously healthy and starting to show their first fruits. 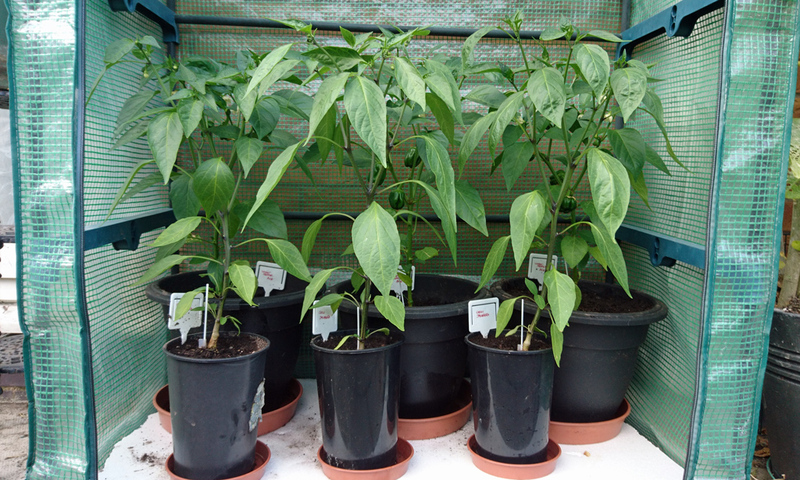 Potting up the chilli and sweet pepper plug plants as soon as they arrived in mid-May. 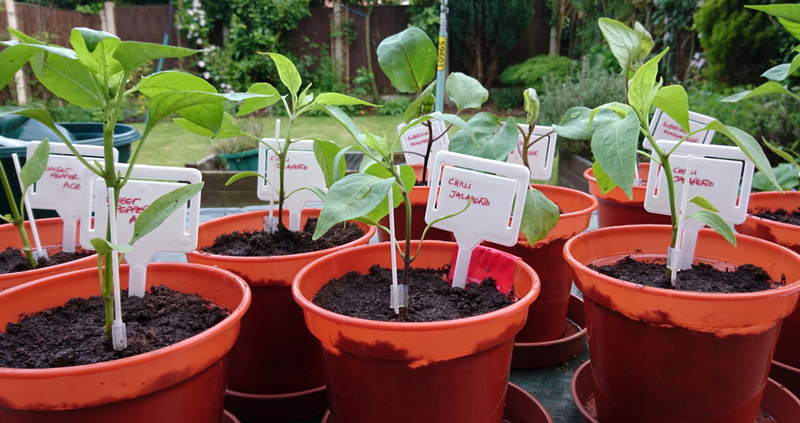 And today: Chilli and sweet pepper plants on 1st July. 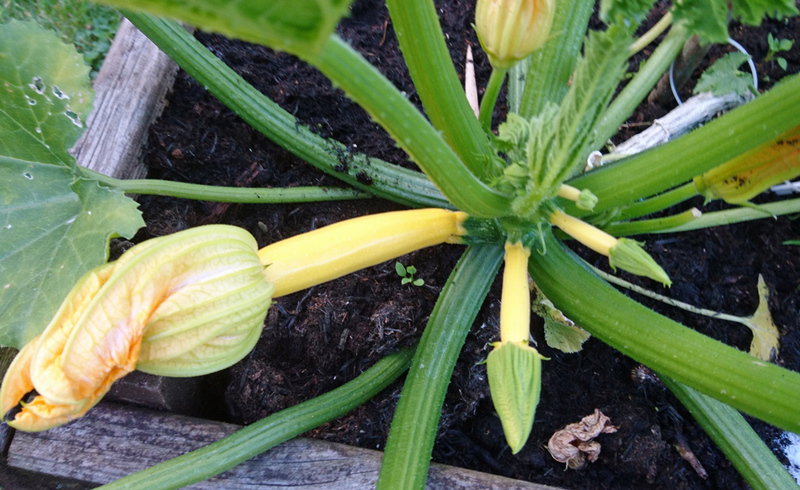 Now 18″ (45cm) tall with flowers and fruit starting to appear. I also bought plants of three tomato varieties and a couple of cucumber plants. The cukes are the Carmen variety, also grafted, and it was only a couple of weeks after planting them outside that I realised they’re a greenhouse, not outdoor variety. Oh well, we’ll see how they get on. I may just surround them with some small furniture and a piece of carpet to make them think they’re indoors. Aviditas – a mini plum variety, F1 hybrid and cordon format. Crimson Crush – traditional large red tomato, F1 cordon, and popular for its apparent resistance to blight, so this is my fallback position if the others are hit. It’s early days for all the bought plants but they’re doing well so far, to the extent that I’m converted: growing from seed will always be the preference in my heart, but I’m now much more open to buying good grafted plants when necessary. Broccoli Raab, stem and leaf with a small bloom head, cooked in a steam bag in the microwave for two minutes. Delicious broccoli taste, packed with nutrients and there’s plenty more still growing. It doesn’t half attract cabbage white butterflies though, so I must watch out for caterpillars. Lemon Balm, wonderful lemon-scented herb that’s been growing away in the border for ages. I picked a whole load and dried it in the dehydrator. That’s now going into home-made tea bag mixes. I’ve dried blueberries and figs which the lemon balm should blend nicely with. Rhubarb, cut back in the spring, boiled and turned into a rhubarb syrup, currently maturing in a wine bottle in a dark spot. All being well this will accompany large glasses of gin in the near future. Lettuce, regularly picking leaves from a row of colourful Rosedale lettuces to go with lunch. 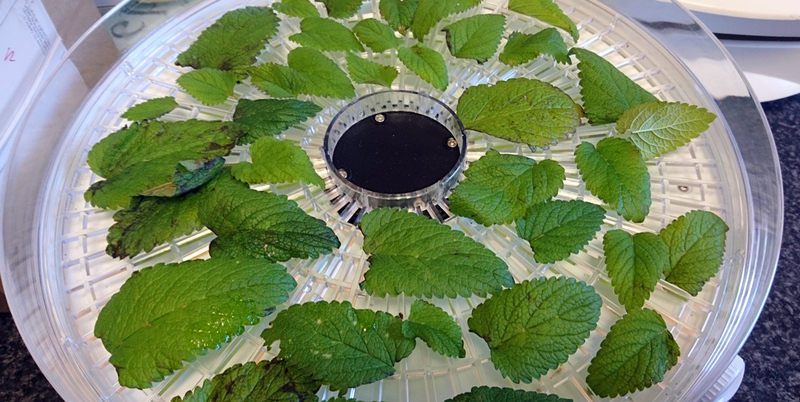 Dehydrating lemon balm leaves, hoping to preserve their intoxicating aroma. Dried lemon balm, ready for home-made tea blends. Next up for sowing are some new wild rocket and Basil. The basil is a bit last minute but I got a delightful selection pack of eight different varieties from the very interesting Jungle Seeds and am going to sow several of them (more next time). 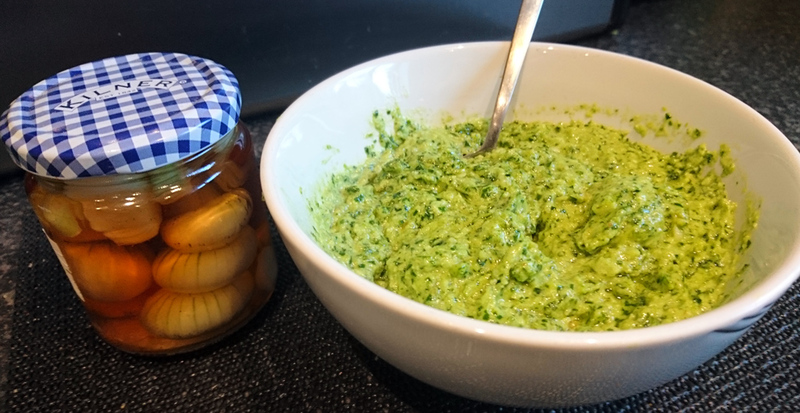 Of course standard basil sets one up for home-made pesto later in the year, but in the meantime I tried a slightly leftfield rocket pesto recently. I had to lift a bushy cluster of wild rocket to make way for the tomato plants, so mixed it in with pine nuts, some over-wintered Lisbon spring onions, pecorino and olive oil. There was a hint of bitterness as the rocket plant was getting on a bit, but it was a nice interesting treat with pasta. Rocket pesto. And some home-grown pickled onions. Elsewhere the first courgettes should be ready for picking next weekend. I’ve two varieties on the go: a single Tuscany plant and two Lemona plants. Tuscany is an old favourite, which makes finely-flavoured and smooth dark green fruits. Lemona is a new grow for me. Its courgettes are clearly yellow but their taste and quality are something I’m still looking forward to discovering. What a mess! I tend to sow sparsely, so that some of the greens that need to be thinned get big enough to make baby greens by the time they get plucked. It as not my idea, but the neighbor likes it that way. Yes, the thinnings that I took out did make tasty toppings etc.